The engraving above is from John Ogilby's map of Ipswich, 1674. Above: the church from the south-east corner showing the diagonal path to the priest's door into the chancel. Once the whole churchyard was surrounded by walls and a gate would have enabled access to this path. Above: the church from the nort-east corner. Although St Clement Church doesn't appear at first to have much to offer the lettering-hunter, it does have historic texts connected to it. The church was declared redundant in the early 1970s. Immediately outside the west door of the church is a stone obelisk, apparently erected in 1996 after the refurbishments following a disastrous fire which badly damaged the interior and the 1880s roof. The story is told that in September 1995, during a period when the church was being used to store props from the Wolsey Theatre, some criminals believed that it actually contained supplies intended for Bosnian refugees. They broke through the mesh protection of a stained glass window to the east end of the south aisle of the church (away from public view, being the night-time), smashing the rather fine Victorian window to gain access. Being somewhat disappointed by the theatrical contents of the church, they set fire to it. 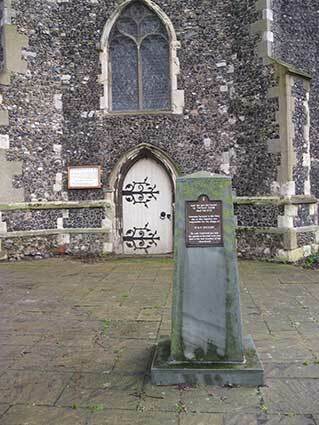 The Ipswich Historic Churches Trust, having cared for the church since 1981, was able to put it back in order. Almost two-thirds of the roof covering was lost, but the Victorian rafters only needed cleaning. 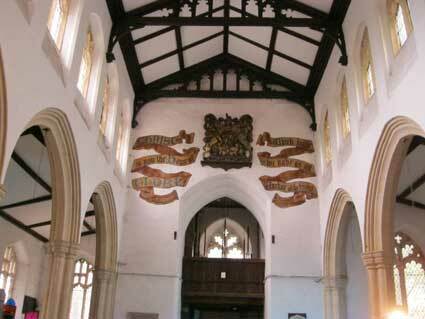 The replacement interior roof we see today presents a rather ‘new’ appearance for a medieval church. The tower has also been restored by the Trust. 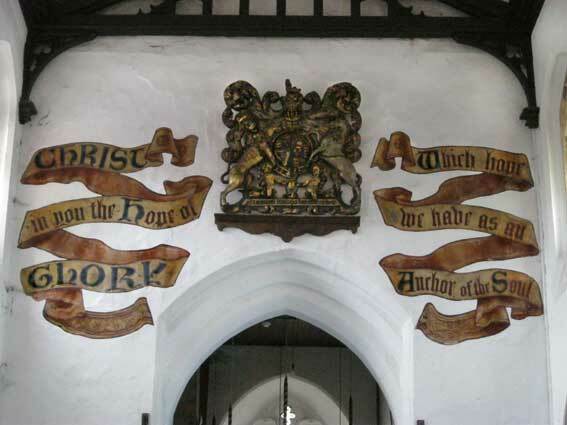 The Royal Coat of Arms, dating to the 1660s (shown below) remarkably survived the blaze and it, and the scrolled mottos were also restored by the IHCT. See our Plaques page for the full text. Two famous mariners are buried at the church, their whereabouts unknown: the designer of Nelson's flagship, Sir Thomas Slade and Thomas Eldred (1561–1624), who had a house (now demolished) at 97 Fore Street (shown on our Isaac Lord page), immediately south of the south porch. Here he carried on a chandler’s business after his sea voyages were over. 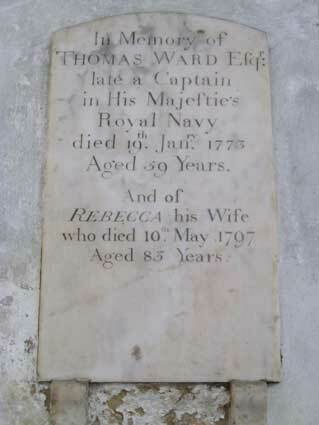 Eldred sailed with Thomas Cavendish as his navigator and was one of only fifty men to survive this, the second circumnavigation by Englishmen. 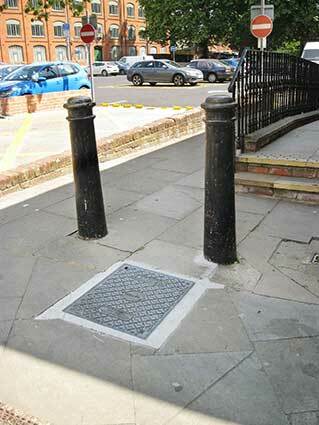 Have a look at our Street furniture (Waterworks) page for an 1881 map which includes the church. 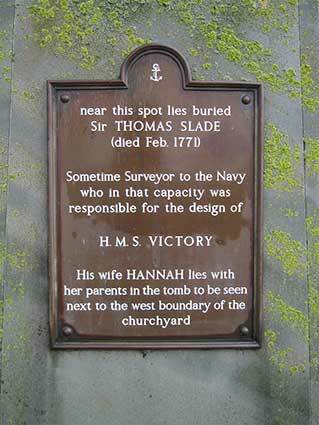 The northern part of the St Clement Parochial Church Hall site is now a car park and the entrance off Star Lane (close to its street nameplate – see our Street furniture page under 'Ground level (Ipswich Corporation Water Works)') is labelled 'SIR THOMAS SLADE COURT', once again memorialising the designer of HMS Victory; see the Slade memorial above. 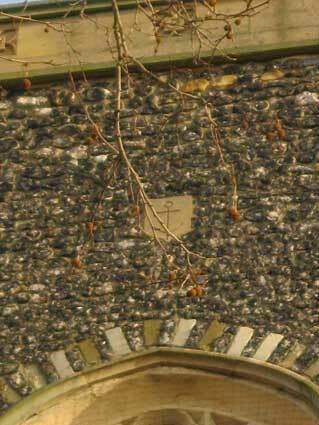 The church tower behind the above obelisk features two of the signature anchors of St Clement on one face. Among many traditions of St Clement there is a fascinating one. St. Clement was exiled to the Crimea and was condemned to work in the marble quarries there (he is, amongst other things the patron saint of stone-cutters). He was subsequently martyred in AD98 by being thrown into the Black Sea with an anchor tied round his neck. His friends were grieved that they could not recover his body, so they begged God to tell them how it could be found. Their prayers were answered, for the sea retired and when they followed the receding waters they found his body enshrined in a beautiful temple built by angelic hands. The anchor is now St. Clement’s symbol. He is sometimes represented with a fountain near him, which is said to have sprung up when he and his fellow workers were dying of thirst in a desert place among the quarries where he was condemned to work. These notes on the church, initialled 'kw 2013' (Ken Wilson) give us more information on the importance of St Clement. 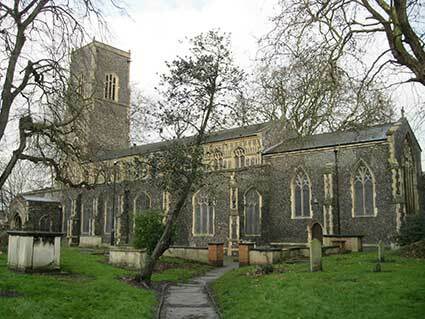 "St Clement's is one of our twelve surviving medieval churches (only York and Norwich have more) and of the half of these that have been declared redundant it is, sadly, the only one for which a use has not been found*. 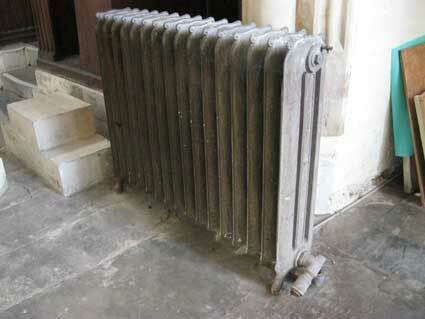 It is therefore cared for by the Ipswich Historic Churches Trust [see Links]. Although the church now looks a little folorn it is still very impressive – certainly from the outside and the interior perhaps even more so. 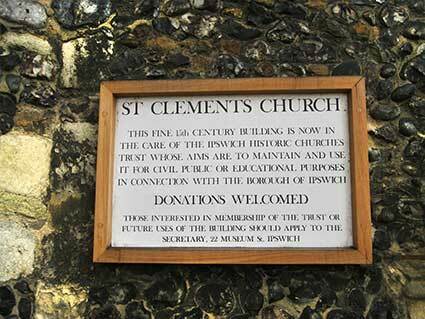 It is the only St Clement's in Suffolk§. The main structure dates from the late 14th and early 15th centuries, although the upper part of the tower is Tudor [1485-1603] and the chancel was rebuilt in 1860 to the design of Frederick Barnes. It is one of our three dockside churches and was long known as The Sailor's Church; many interesting monuments attest to this association. The circumnavigator Thomas Eldred and Thomas Slade the designer of Nelson's 'Victory' are the two most famous burials here. 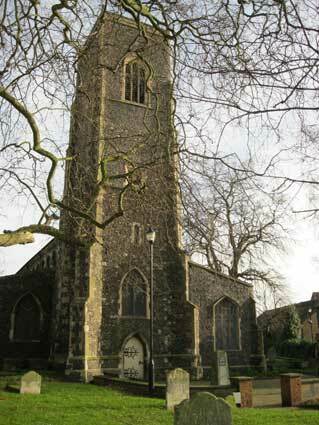 The tower holds six bells by John Darbie of Ipswich and the clock has a carillon (now in need of repair) from which every three hours during the day, hymn tunes once rang out. This was a notable local feature and was for many years celebrated by a nearby inn called 'The Musical Clock'%. Two small monumental brasses, one missing a figure, are to be seen at the east end of the nave and in the south aisle there are indications that a third one has been lost. 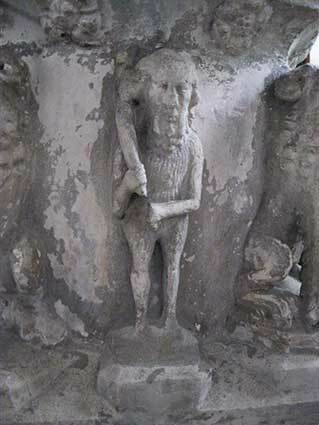 The 15th century font depicts the four evangelists along with shields and lions but at the base, strangely but not unusually, there are wild, hairy men bearing clubs±. The carved and painted royal arms survive from 1661when Charles II of England, Scotland & Ireland was crowned in Westminster Abbey, for the second time; the arms feature, unusually, images of Adam and Eve at the base. The organ now welcomes parishioners in Selworthy, Somerset. 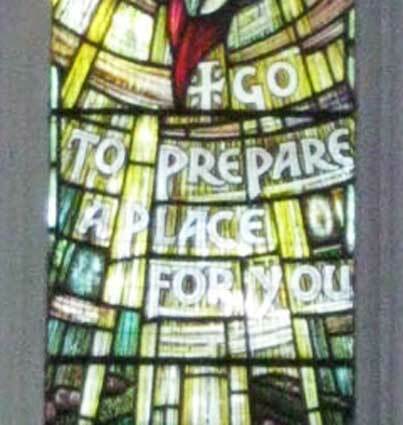 There are three good Victorian stained glass windows and a very impressive east window of modern glass that commemorates those of the parish who fell in the Second World War. 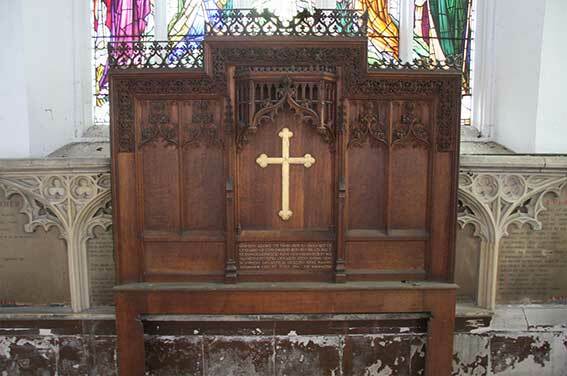 Below it the fine reredos is a reminder of that earlier conflict." [*This sheet was handed out at an event in May 2014 at the church (when the photographs, below, of the interior were taken) when the late Dr John Blatchly, Chair of the I.H.C.T., spoke eloquently and plans were laid for conversion of the church into Ipswich Arts Centre, similar to those in churches in Norwich and Colchester. %An inn, its location somewhere near to the church, called The Musical Clock dated to before 1744 and closed down in the 1880s, so it seems unrelated to the carillon, which was installed in 1884. Information from the Suffolk CAMRA site, see Links. In 2016 the church started its slow, steady transformation into Ipswich Arts Centre. Two carved stone gargoyles can be found either side of a buttress in the north-east corner of the church. Strictly speaking, a gargoyle is a water-spout – often grotesque in form – designed to carry water from a roof outwards to the ground and away from the exterior walls of a building. The features here carry spouting (which penetrates the flint wall) below the heads which delivers the rainwater into decorative rain-hoppers. The right-hand example is the slightly more nightmarish of the two, but has suffered some damage and lost the lower jaw. The north face of the tower bears a pierced clock dial with gold Roman numerals and hands, the flint flushwork showing through. 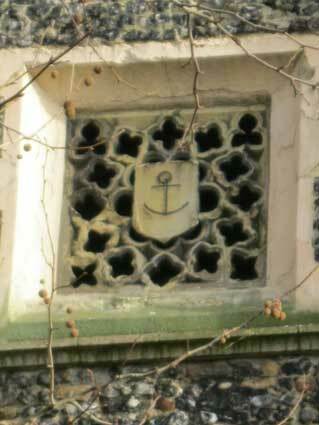 The south carries a black convex clock face with gold Roman numerals and hands, all set in a stone roundel against the flint breaking a stone cornice below. Both are late 19th century additions. In 1884, a clock and mechanical chiming mechanism – known as a carillon, which was the gift of Felix Thornley Cobbold (who was also the befactor of the nearby Fore Street Baths, also Gippeswyk Park and Christchurch Mansion), was installed. The clock and mechanism were built by Gillett & Co Steam Clock Factory, Croydon. Chiming every three hours, a different tune was played on the carillon on each day of the week. It has remained silent for many years, but in 2018 the Ipswich Historic Churches Trust are installing an electronic chiming mechanism to revive the atmospheric sound of church bells ringing out hymn tunes. 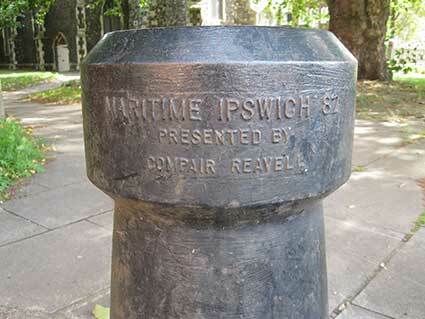 See our page on Public clocks in Ipswich for a view of the church and its clock(s). 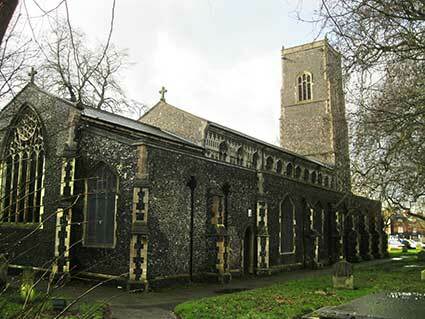 Simon's Suffolk Churches (see Links) tells us that: "The royal arms, which fortunately survived the fire, are probably the best example of Ipswich's familiar Charles II sets - these are different to the others in that they are carved and gilded rather than being painted on boards or canvas." Dating from the Restoration of Charles II in 1661, it shows, perhaps unusually, the figures of Adam and Eve between the lion and the unicorn ramapnt and below the central Order of the Garter enclosing the crest. 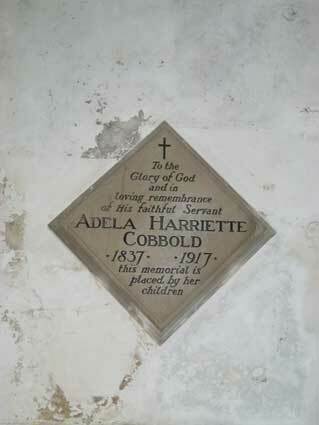 There are a number of memorials in the church including several relating to the famous Cobbold family of the Tolly Cobbold brewery. St Clement, as well as being known as 'The Sailor's Church', can also be thought of as 'The Cobbold Church', as we shall see. 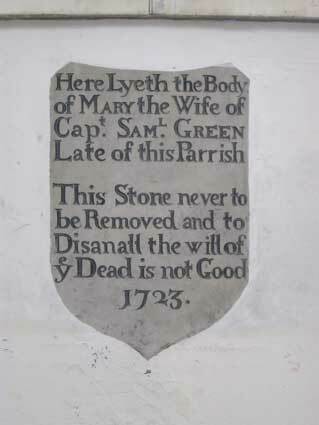 The word 'Disanall' probably means disannul or ‘declare to be invalid’; this amounts almost to the threat of a curse on anyone who removes the stone. 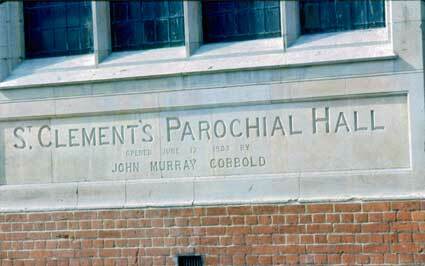 The double-'r' in 'Parrish' is somehow satisfying. 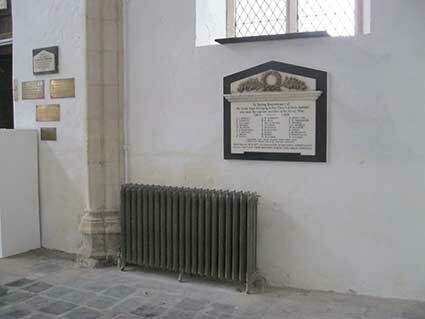 Above: the original St Clement Church World War I memorial. 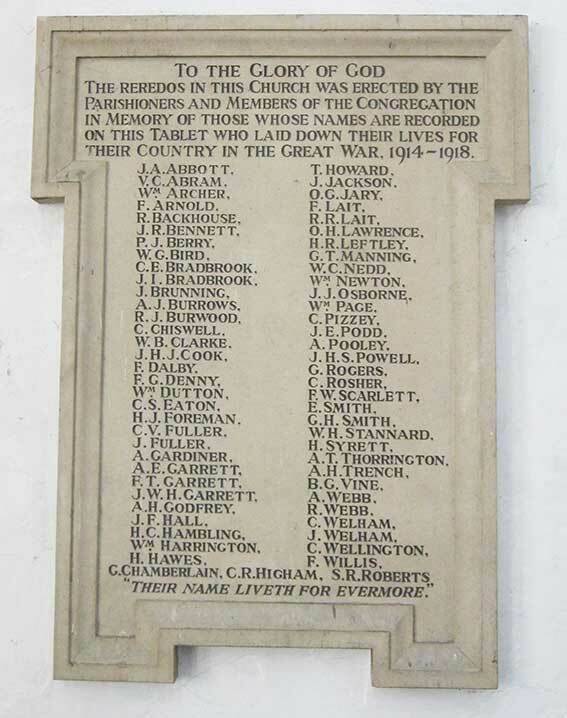 Below: the resited World War I memorial towards the north west corner, from St Clement Congregational Church (this page shows the original site of the plaque), placed here in 2017. Dating from 1860, the chancel is less spacious than the rest of the (mainly 15th century) church. The broad chancel arch is largely 19th century, its chunky, shaped timber base shown above. 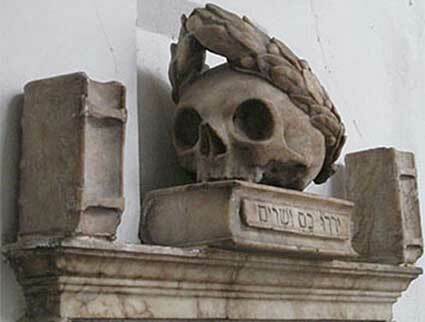 To the right of it is a mural memorial (see close -up above right) with a skull bearing an olive wreath sitting on a Hebrew book, with a book upright on each side. 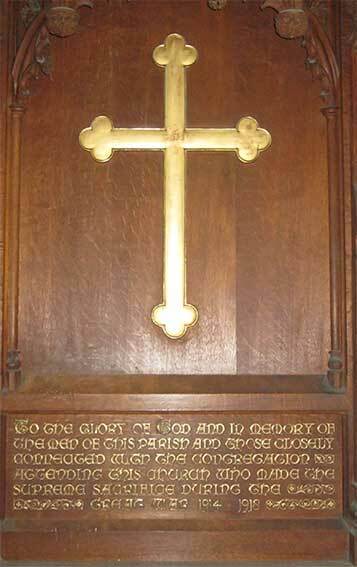 Behind the altar is an oak reredos (altar screen) which was placed there – like the tablet in the south porch – in memory of those who died in World War I. 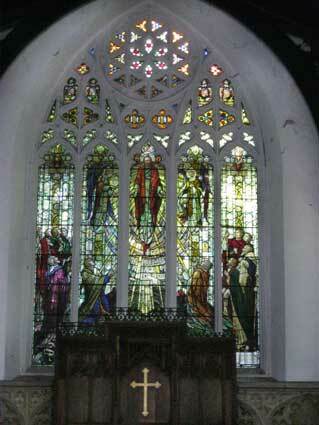 Behind the reredos is the great east window which reminds us of those who fell in World War II. The beautiful glass in this window was placed here in 1948-9 to replace that destroyed by the bombing of the war years. 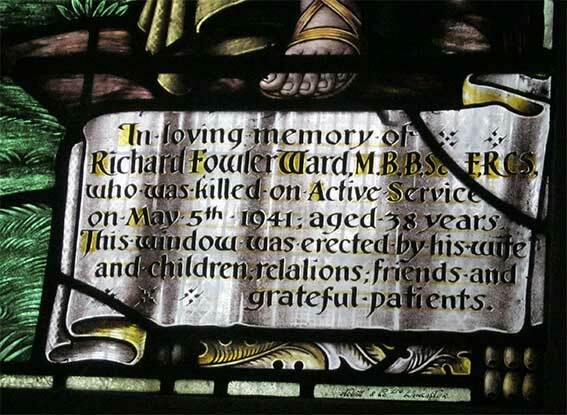 In 1949 the window was dedicated to the memory of Dr Ward who served and died in the war. The reredos does obscure some of the lower part of the east window. 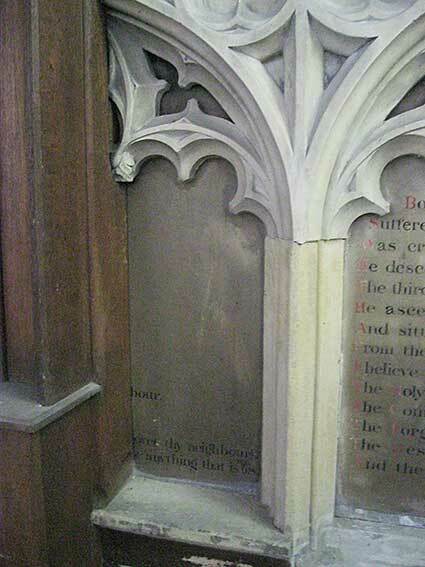 The pierced upper part of the reredos is damaged to the right and one wonders if this occurred when the screen was, presumably, removed for the fitting of the window. The reredos has been fitted so as to obscure more: the decorative stonework panels which once would have acted as the backdrop to a crucifix on an altar-table bear religios texts in black and red characters. 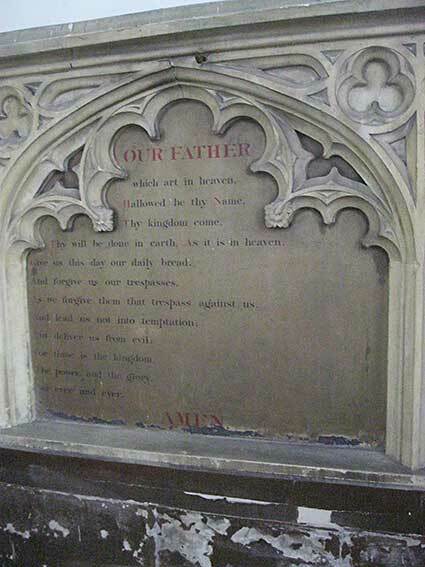 The Lord's Prayer is fully visible to the left, then the Ten Commandments are obscured on the panels at each side. The Apostles' Creed is fully visible to the right of the reredos. 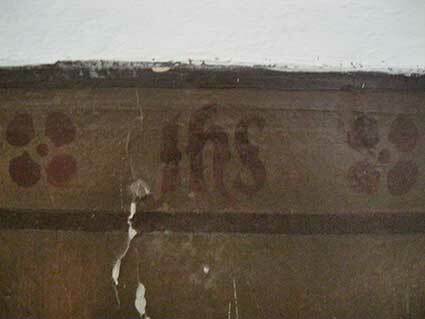 There is a hand-painted frieze featuring the initials 'ihs' (see our page on the Church of St Peter for an explanation) in dark red with a flower motif against dark brown (varnished?) plasterwork. 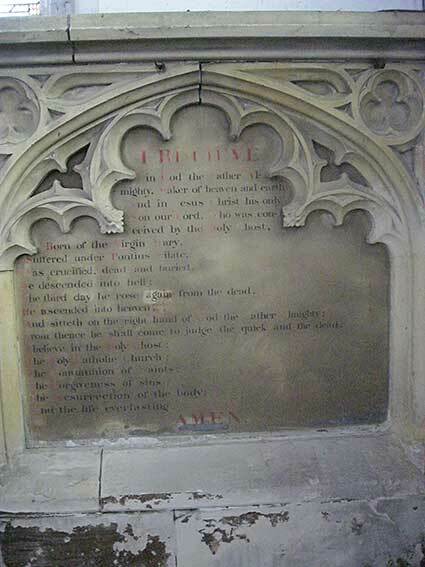 This frieze lines the walls of the chancel. 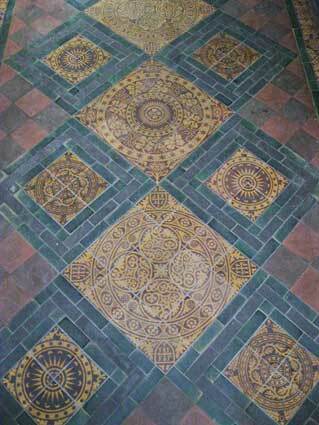 Below: some of the decorative floor tiling in the chancel. 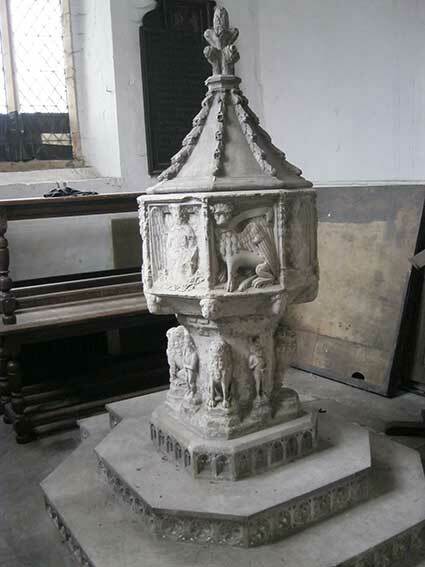 The rather fine baptismal font is tucked away in the south-west corner, perhaps removed from the church and possibly plastered over to avoid the destructive attentions of puritans in the century following the dissolution of the monasteries (1536-1541) and establishment of the Church of England. The Earl of Manchester gave Parliamentary commander William Dowsing (1596–1668) the brief of enforcing the August 1643 ordinance against religious images, seen as idolatry, in the eastern counties during the English Civil War (1642–1651). Dowsing conducted a relentless campaign of iconoclastic reformation on a scale that does not appear to have been undertaken anywhere else in the country, including London. 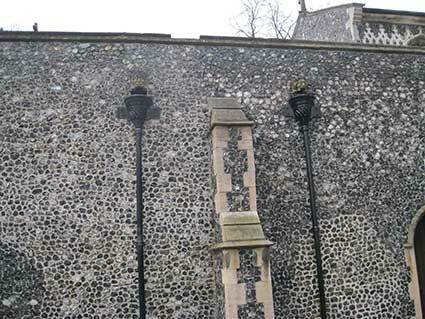 Over 250 churches in Cambridgeshire and Suffolk were 'purged'. 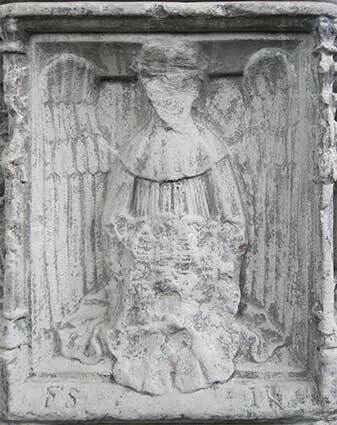 This is why so many Suffolk church fonts, sculptures and figurines have their faces knocked off or obliterated. The font was rerturned to the church once Charles II had regained the throne in 1660 (see also the Royal Arms, above). Its present site in the west end of the south aisle, forming a well-lit Baptistry, was probably the work of Victorians, perhaps at the same time that the chancel was rebuilt; the stepped plinth on which the font stands is Victorian. The font is octagonal in shape. Round the sides are emblems of the Saints: winged ox (St Luke), winged lion (St Mark), eagle (St John) and a seated, winged angel with the face of a man (St Matthew). 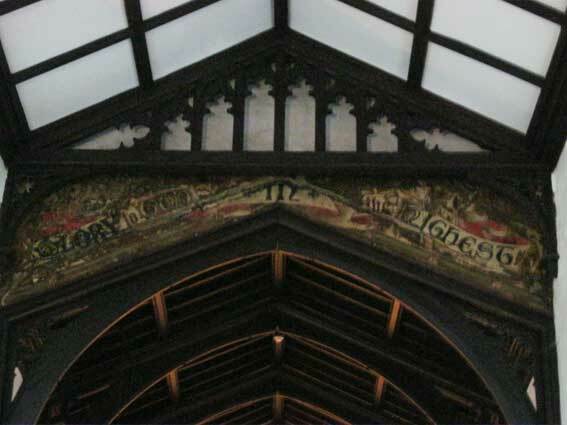 The contemporary churchwardens had their initials (‘FS’: Fitz Sample, a local baker and ‘JK’: John Keeble, a mariner) scribed on the lower frame of the winged angel panel (visible in the photograph above right). On the base, contrastingly, are the figures of wild, hairy men (above right). 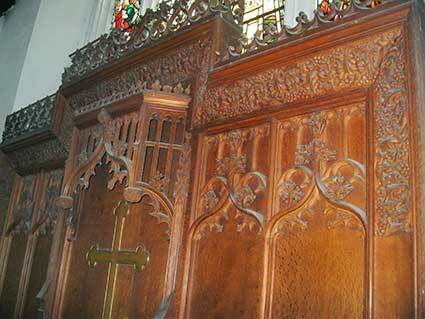 The font cover is plastered/painted timber of Victorian manufacture. 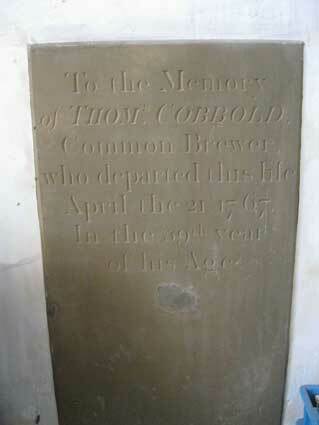 He is described here as ‘Common Brewer’, probably a trade term meaning that his brewery sold beer wholesale as well as selling through his own outlets (thanks to Anthony Cobbold of the Cobbold Family History Trust – see Links). Above: the Church of St Clement in the snow, March 2018. 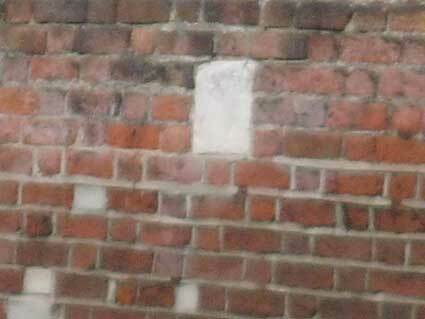 Boundary markers can be found for St Clements parish which stretches all the way from the Wet Dock to St Clements Hospital in Foxhall Road. Such things happen, no doubt when you have three large parish churches within about a mile along the northern edge of the Wet Dock (including St Mary-at-Quay and St Peter's Church). 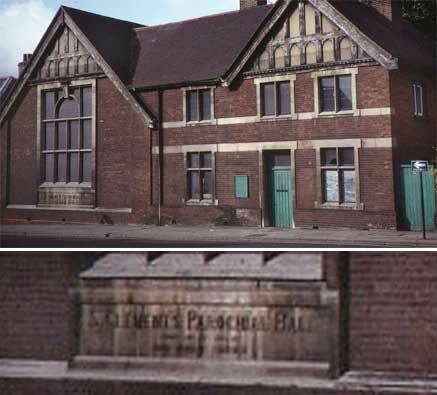 You can see the parish marker on our Old Hospitals page. 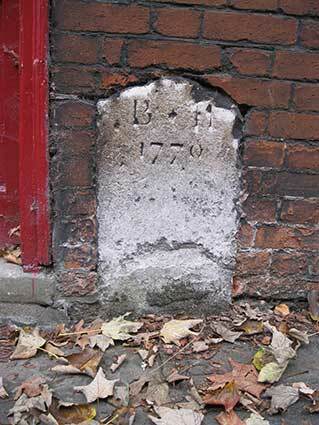 See our Boundary marker gallery for further examples. See our Boundary markers gallery for better images. 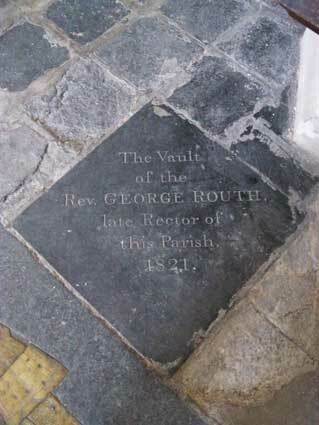 We assume that this large name tablet was covered with cement (photographs below) when the church sold the hall for commercial use. In 2013 it is a private gymnasium. We believe that the early 19th century house visible to the left of the hall was the vicarage of St Clement at 68 Grimwade Street. It is Listed GradeII. 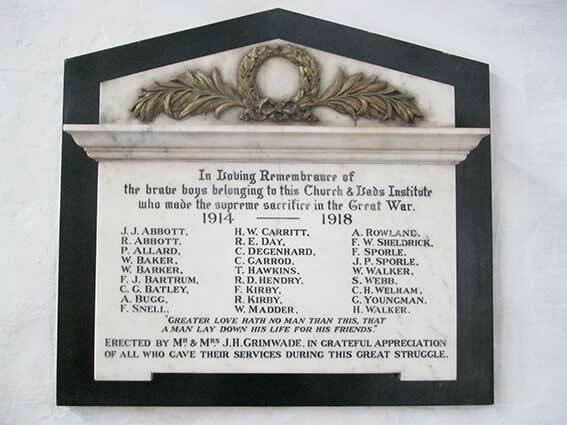 [UPDATE 19.12.2013: "The talk you gave at Museum Street Church on Wednesday evening was a rewarding demonstration of how one can so easily miss enjoyable details of the local area. Thank you for that. 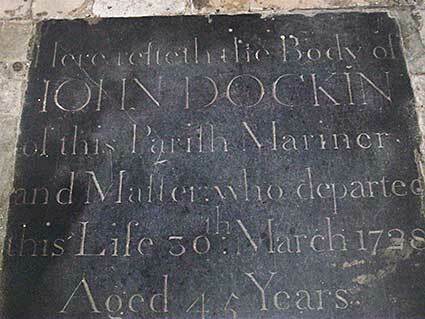 I have been a resident of Ipswich for all of my seventy-four years and thus soon found my way to your very interesting website, of which, so far, I have not had time to examine in depth. However, I believe the two attached pictures, that I took, in the pre-digital age of – I think the mid nineteen-eighties – might actually be a small improvement on the relevant ones you already have. Please use them as you wish. 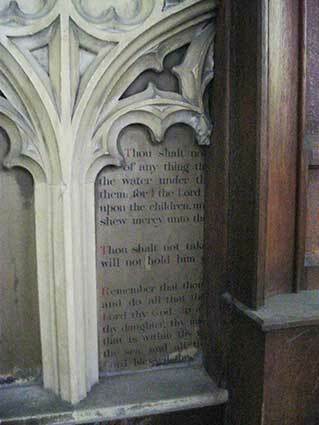 At last we can read the nicely chiselled lettering below the east window of the hall and can't help speculating why someone has bothered to cover it up with cement. The Cobbold Family History Trust (always an invaluable resource for all things 'Cobbold': see Links) tells us that John Murray Cobbold (1897-1944) was an '8th generation Brewer. Founder of Ipswich Town Football Club'. "The sixth John Cobbold, grandson of the Earl of Dunmore, must have vexed his parents for he was nicknamed 'Ivan the terrible.' It stuck and he was known as Ivan for the rest of his life. He joined the Scots Guards in 1915, was injured but not seriously in France and left the army at the end of the war. He was a keen sportsman and as one of the best shots in the country it was a pursuit he shared with King George VI. He joined the family brewing business and was present at the 200th anniversary celebrations on 30th July 1923 at Holywells succeeding to the chairmanship on his father's death in 1929. Following a chance meeting with Sir Samuel Hill-Wood, Chairman of Arsenal and a visit to Highbury 'Capt.' Ivan (as he then was) put up the money necessary for Ipswich Town Football Club to turn professional. 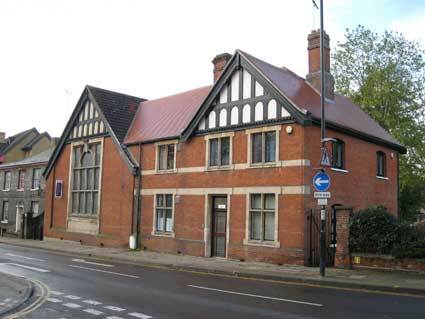 The amateur club had been founded in 1878 by the boys of Ipswich School under the presidency of Thomas Clement Cobbold MP (1833-1883) his great uncle, with a distinctive Corinthian culture which survives to this day. WWII saw him back in uniform now with the rank of Colonel only to be tragically killed when a doodlebug hit the Guards Chapel during Sunday morning service on 18th June 1944. 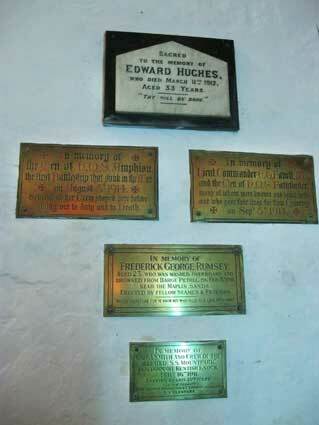 Ironically it was in that same chapel that he had married Lady Blanche, daughter of the 11th Duke of Devonshire. They had just celebrated their Silver Wedding." 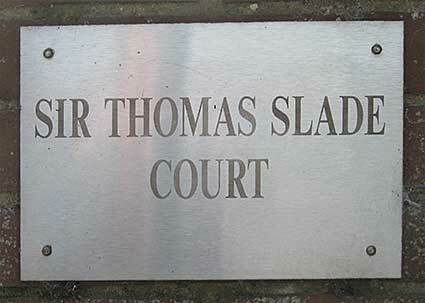 See above for 'Sir Thomas Slade Court'. Click for more about Boundary markers. ‘In ancient times, the banks on this side [the north and east of what we today know as the Wet Dock] of the river were inhabited by the principle people of the town: and it is certain that many of their houses have been converted into malt-offices; several of which are still objects of curiosity, and their origins worthy of research. We can remember, in our time, when the most eminent merchants in the place occupied the many capital mansions near this spot, which are now empty, and going to decay; as it is, at present, the fashion for them to remove from the confinement and bustle of business, to their elegant rural retreats in the suburbs: in the consequence of which, the vicinity of Ipswich has been very much improved. 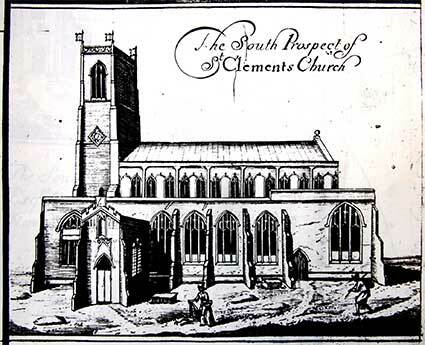 St. Clement’s Church was early and wholly impropriated to the Priory of St. Peter, without any vicarage created: and its being thus impropriated, when the last value was made, it was not valued in the king’s books. It was granted, in the seventh year of Edward VI. [? : reigned 1547-1553] to Webb and Breton; but it afterwards came to Robert Broke and William Bloise; who presented a clerk to the rectory, in 1606, and thereby restored the rector to all his rights and dues. This church is now consolidated with St Helen’s. “King Richard gave Wykes, a member of Ipswich, to John Oxenford, bishop of Norwich; which shall answer to Ipswich for £10, and the bishop of Norwich holdeth it, but it is not known by what service.” It appears by Ipswich Domesday, that, in the time of Richard I., the town used to pay £10 per annum, to the bishop of Norwich, – to be deducted out of the fee-farm rent. The hamlet and manor of Wykes Bishop, was, afterwards confirmed to John le Gray, bishop of Norwich by King John; and it belonged to the bishops of Norwich, till it was given to King Henry VIII., by act of parliament, in 1535; who granted it, 1545, to Sir John Jermie, Knight. John Cobbold, esq., is, at present, lord of the manor. While the bishops of Norwich had it, they used, frequently, to reside at their house, situated near the south side of the road leading towards Nacton, from Bishops’ Hill; which is, now, a square field, that appears to have been, formerly, moated round. 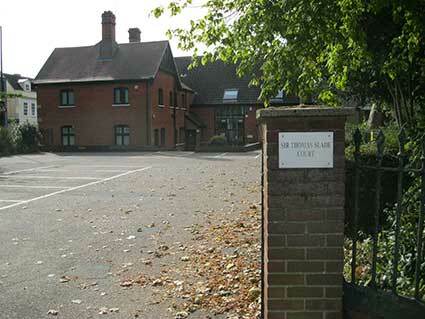 Many institutions, &c. are said, in the books at Norwich, to have been granted at this place. The church of Wykes is sometimes mentioned in old writings; but it is not known where it stood, and, possibly, it might be no more than a chapel, for the use of the bishop and his family. Within this parish lieth, also, part of the hamlet of Wykes Ufford, though the greater part of it is in the parishes of Rushmere and Westerfield: it was so called from the family of De Ufford, who were earls of Suffolk, to whom it was granted. In the tenth year of Edward II. 1316, Robert de Ufford held, on the day of his death, a certain soke, in Wyke junta, Gippiwic, with view of frank pledge, and other appurtenances, to the said soke, belonging to the King in Capite, by the service of one knight’s fee, and £4 : 13 : 4 rent of the profits of the toll of the town of Ipswich, of the K. of C. by the service aforesaid, and a tenement called Kettleber-west-heath, in soccage, by the service of one pair of gilded spurs, annually; and, also, of the K. in C. the manor of Ufford, by the service of one knight’s fee. The Willoughbys had it, afterwards, by descent, from Charles Brandon, duke of Suffolk; in Queen Elizabeth’s time, Sir John Brewes; then Sir Edmund Witypoll, and it has gone with the Christ Church state ever since; but the advowson is now vested in the Rev. J.T. Nottidge, A.M. Beyond St Clement’s street, between the two hamlets, stood St. James’s Chapel; which probably belonged to St. James’s Hospital, situated on a piece of ground abutting on the Rope-ground, about half an acre, more or less; which is glebe belonging to St Helen’s rectory. From hence, and from the fair which King John, in 1199, granted to the lepers of St. Mary Magdalene, in Ipswich, to be held on the morrow of St. James’ Hospital and the leprous-house of St. Mary Magdalene; which stood somewhere near St. Helen’s church. 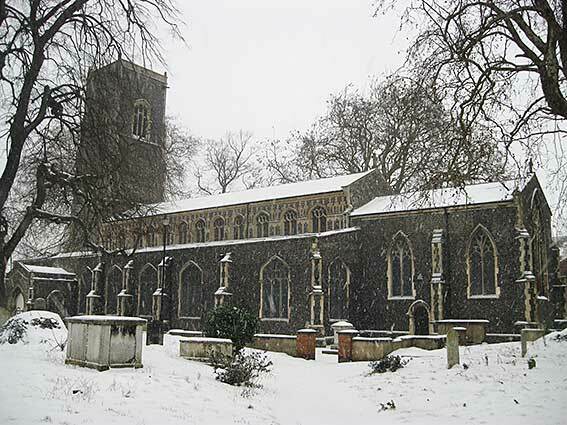 It is not known at what period St. Clement’s church was built, as it is not mentioned in Doomsday. It was, probably, erected instead of the dilapidated church of Osterbolt, which stood near where the stepples formerly were, at the Bull’s Head corner, and took its name from the east-gate that was near this spot. The antiquated church of Osterbolt is mentioned in the twenty-first year of Edward III. 1348; therefore, the present church must have been built since that time., for it appears to be not very ancient. To the left of the Parochial Church Hall is a very old thoroughfare, now a shadow of its former self: St Clements Church Lane. At the Grimwade Street end is a pair of bollards to prevent vehicular access beneath an attractive iron arch with central hanging lamp. 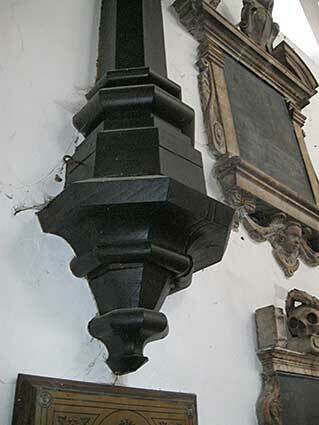 We believe that The Ipswich Society (see Links) lobbied for the lamp to be made live and lit at night. 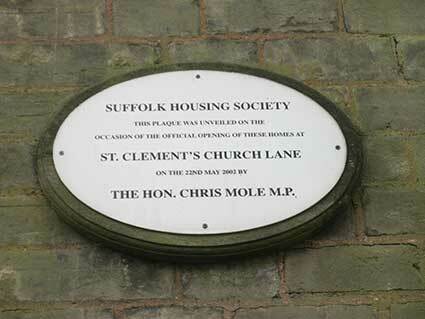 Some conflict between the two street nameplates: on the church hall side it is merely 'ST. CLEMENTS' (interesting to see the unnecessary full stop here); on the opposite wall a nameplate with coat of arms reads 'ST. CLEMENTS CHURCH LANE'. 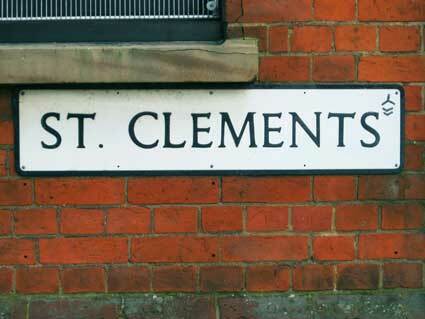 As is common with street nameplates, there is no possessive apostrophe. One wonders why the passageway warrants two nameplates when some larger thoroughfares have one or none, also why they differ. An 1881 map detail of the area can be viewed on our Street furniture page (relating to the Ipswich Corporation Water Works); it shows the western end of 'ST. CLEMENT'S CHURCH LANE', opposite the present site of Fore Street Baths, (opened 1894) the houses stand shoulder-to shoulder down to the junction with Angel Lane and Fore Street. Angel Lane in modern times is a mere entrance to a car park. and the larger, more difficult to decipher, is dated '1771'. 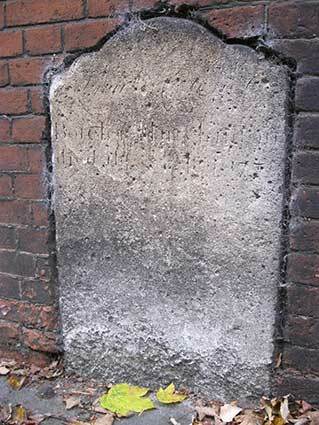 Other headstones, no doubt moved from their original places in the churchyard, stand along the lane. 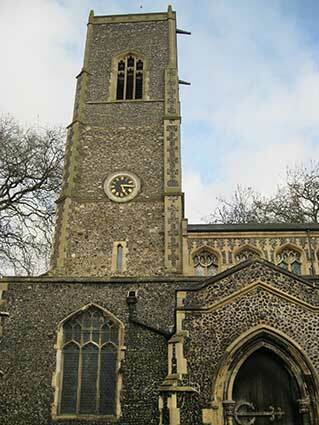 Here is the south elevation of St Clement, the tower bearing a smart clock with gold characters. 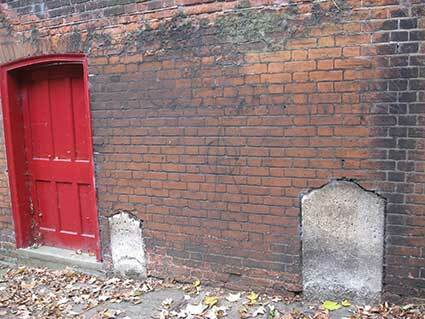 Further down St Clements Church lane, at the north-east corner of the Fore Street Baths building is a rear entrance and passageway down to the back of The Lord Nelson public house (fronting 81 Fore Street). 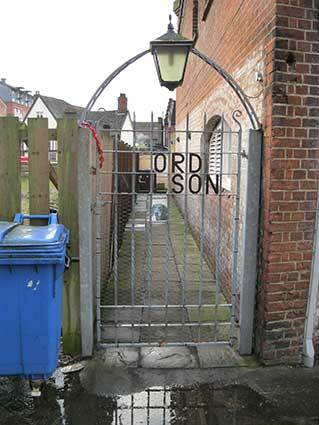 The wrought iron gate with its pleasant metal arch and central lamp, is nicely lettered and painted. An earlier public house here (c. 1750-1807) was called The Noah's Ark. 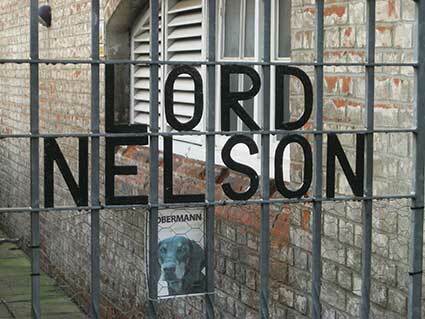 It could have been renamed The Lord Nelson when the great sailor was appointed High Sheriff of Ipswich in 1801. It retained two bars and a separate restaurant room until 1995 when major internal alterations were undertaken [information from Suffolk CAMRA, see Links]. The original, older pub building is to the west; The Lord Nelson is Listed Grade II: "A C17 timber-framed and plastered building with a jettied upper storey to the west half of the block, with exposed timber-framing and exposed joists. 2 storeys and attics. The 1st storey windows are 3, 4 and 5-light mullioned casements with leaded lights. 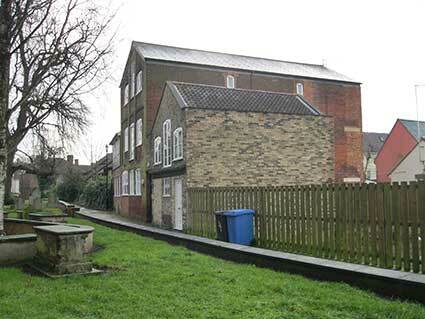 The ground storey is in C20 brick and has continuous windows along the front. 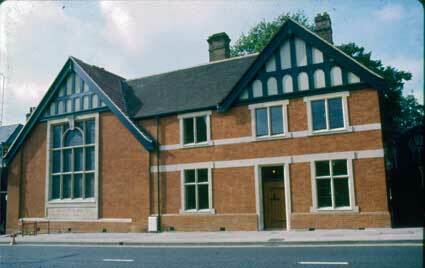 Roof tiled, with 3 gabled dormers." The remarkable period photograph (above right) dates from early to mid-20th century: this is confirmed by the poster for the Ipswich Hippodrome advertising 'Matheson Lang' (1879-1948) who was a Canadian-born stage and film actor and playwright in the early 20th century. The image shown above comes from John Norman's Ipswich Icons column in the EADT, 30 June 2018 about the Church of St Clement. 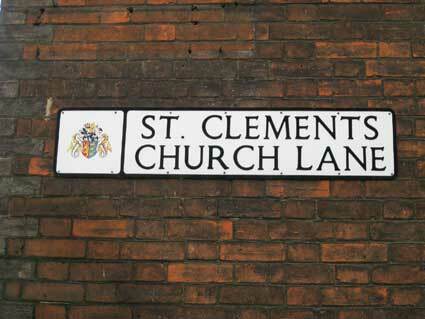 Here is St Clements Church Lane as a 'proper' lane, built up on both sides. 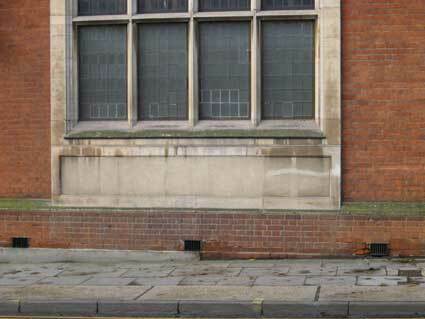 The edge of Fore Street Baths can be seen to the right. 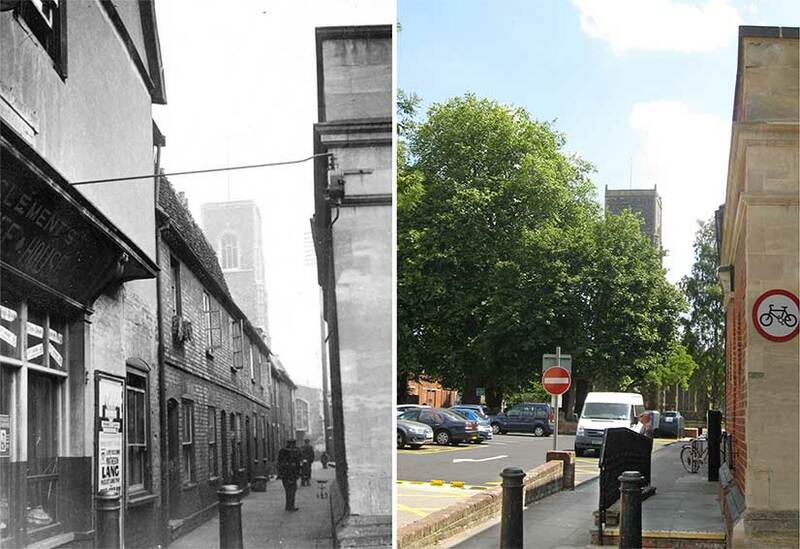 At the near left is the St Clement's Coffe House which appears to be a timber-framed, jettied building – now long gone. The lane is packed with a row of cottages with the the south aisle at the end and the ghostly tower of St Clement above. 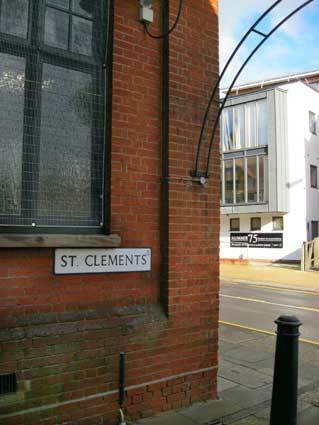 At the upper left can be seen part of the street nameplate: 'St Clements Church Lane', with below it 'St Clements Church' with an arrow (possessive apostrophes uncertain). The photograph has recently been dated 1930. A 2018 photograph from a similar viewpoint is shown above right: rather wonderfully, the cannon-style bollards are still in situ joined by the usual host of 21st century street furniture, bottle-banks, railings and parking ticket machine etc. 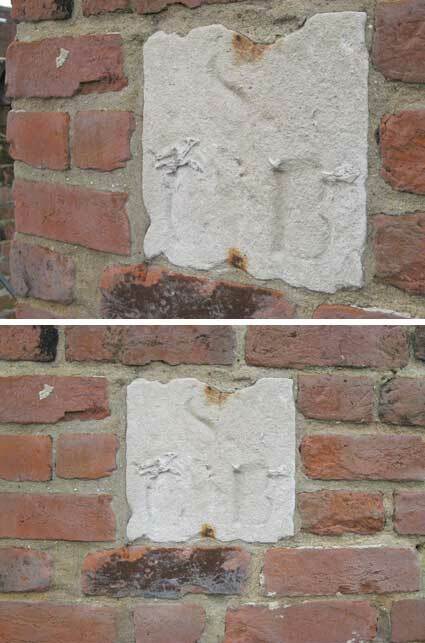 We are told that the bollards found in the lane are cast by one of the local foundries, but at the moment we can't find the reference; there is no casting-mark on these bollards [see UPDATE below]. 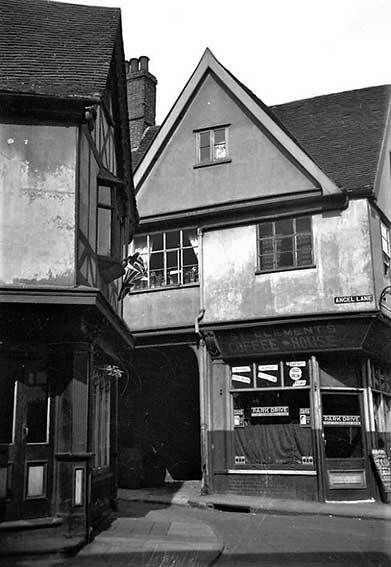 Angel Lane, corner with Fore Street, 1930s? Above: the 'St Clement's Coffee House' is clearly the former Angel Inn with the cart entrance to the left. Teresa King on the Ipswich Society Facebook page notes that it was demolished in the late 1930s, having been in a previous era R. King, Fishmonger and Game Dealer (Teresa's husband's great-great-grandparent's business). This must have been post-1900 when the Angel Inn closed down and before the change of use to the coffee house. Looking at the window advertising – particularly the angled stickers – it is quite possible that this photograph was taken at the same time as the view down St Clements Lane (above), so that would be 1930. The Ipswich Society's Fore Street Facelift 1961website (see Links) under 'History' has more on Angel Lane and this area. 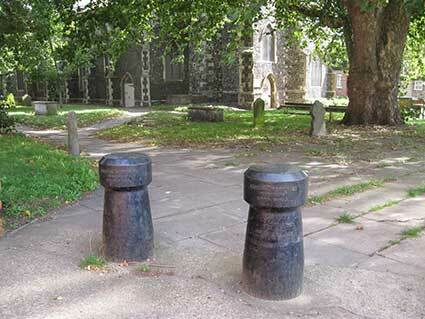 [UPDATE 18.9.2018: The lettered cast bollards have been found on the Star Lane side of the churchyard. 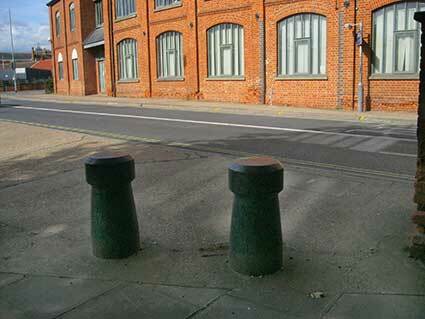 The pair of chunky bollards with the church in the background and (above right) with Star Lane and the Ransomes lanwn mower factory – later, The Foyer – behind. A rare glimpse of this street with no traffic queue, but the shadow at far left indicates a vehicle about to enter the picture. See our St Helens Street page for a 1933 photograph showing The Reavell (later Compair Reavell) 'Ranelagh Works' with its railway line bridge crossing Ranelagh Road. 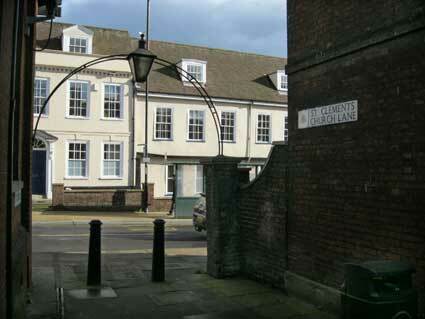 See our Plaques page for 'Maritime Ipswich 82' castings by Crane Co.
See our Warwick Road page for the ownership (1913) by St Clement Parish charities of a large group of houses in Woodbridge Road. See also St Clement Congregational Church, Back Hamlet for a Victorian non-conformist place of worship in this parish.